Despite graduating five senior starters who are now playing collegiate softball, it was another magnificent season for the Bellaire Cardinals softball team. After defeating Cinco Ranch in the bi-district playoffs, the Cardinals raised their record to 25-6 on the season. Bellaire was 14-0 in district to win its 17th district championship in the last 18 seasons. In the bi-district victory over Cinco Ranch, junior Destiny Barclay connected on three home runs in game two of the series, including a grand slam in the ultimate 10-2 victory. “Three homers in a playoff game is remarkable,” said Cardinals head coach Brien Tuffly. 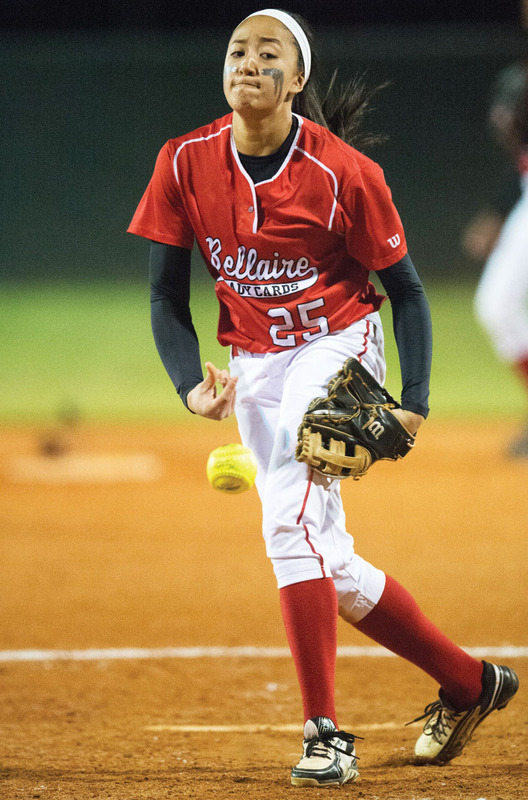 The hard-hitting Bellaire lineup featured several players with battling averages well over the .400 plateau, including junior third baseman Julissa Duenas, junior shortstop Beth Castillo, senior centerfielder Kaelyn Kringle and second baseman Maegan Hollins. In addition, freshmen Jolie Doung and sophomore Chelsea Baxter not only hit above the .400 mark, but both put forth sensational seasons on the pitching mound, with 0.90 and 1.1 ERAs, respectively. At Memorial, the Mustangs softball team won its first district championship in over a decade by going 12-0 in district. With a bi-district playoff victory over Cy Falls, the Mustangs raised their overall record to 23-5 on the season. “The really big thing about this team is that the girls hit the ball extremely well. We had 34 home runs in the regular season, which is pretty extraordinary,” said Mustangs head coach Stephanie Mosley. The biggest homer of the season undoubtedly took place in game one of the bi-district playoff series versus Cy Falls, when sophomore Kaleigh Stallings hit a walk-off, game-winning, three-run homer in the Mustangs’ dramatic 8-7 victory. For the season, Stallings boasted a lofty .632 batting average, with nine home runs. Other big bashers for the Mustangs included Emily Ellis with a .576 average and 10 home runs, Kara Kennedy (.518 average), Kayla Keeling (.475 average/9 home runs) and Jenny Drago (.453 average/4 home runs). The Kinkaid School Falcons earned the SPC baseball championship trophy after defeating Dallas St. Mark’s in the SPC title game. 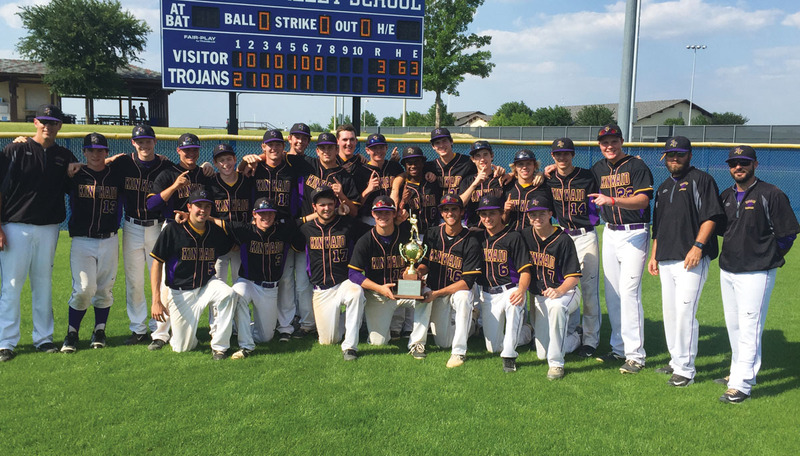 It was Kinkaid’s first SPC baseball championship since 2006. For the first time since 2006, the Kinkaid Falcons are Southwest Preparatory Conference baseball champions. Kinkaid won the crown by defeating Dallas St. Marks 5-3 in the title game of the SPC tournament. The Falcons also beat St. Andrews and Episcopal by identical 6-3 scores at the tournament. Pitchers Will Gaus and Michael Goldack both had great seasons capped off by victories in the SPC tournament. Gaus, the winning pitcher in the win over St. Andrews, had a 9-1 record on the season. Goldack was 7-3 on the season, highlighted by a victory over Episcopal in the SPC tournament. 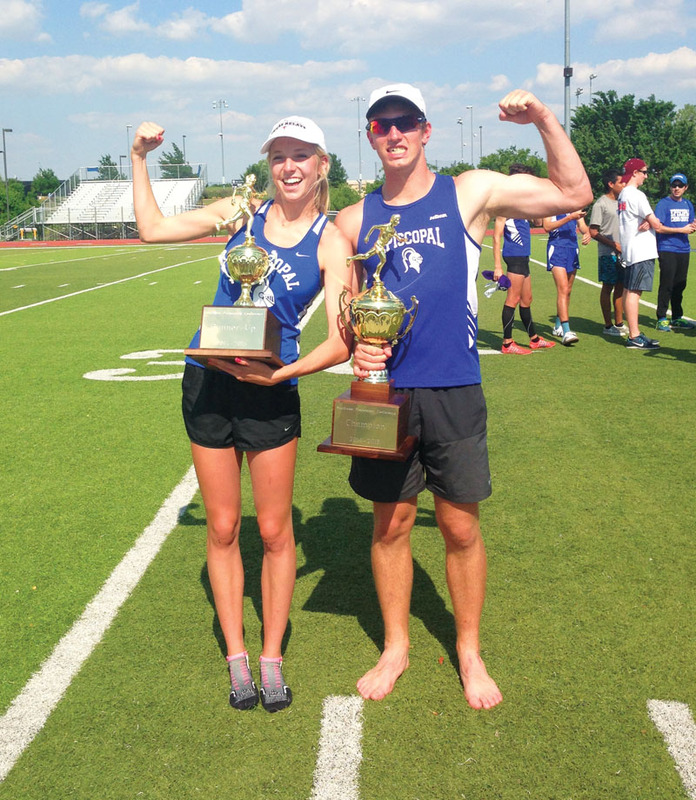 Travis Tolliver and Georgia Wahl led the way for Episcopal at the SPC track and field meet. Led by Tolliver’s four gold medals, the Episcopal boys won their third straight SPC title, while Wahl broke a pair of school records to lead the Episcopal girls to a second-place finish. For the third consecutive year, the Episcopal Knights ran away with the SPC boys track and field championship. The Knights were led by a spectacular meet from Texas Longhorn signee Travis Toliver, who finished first in the high jump and pole vault, while also running on the Knights’ winning 400- and 1600-meter relay teams. Episcopal’s Jack Neary won the shot put with a school-record throw of 58-3, which was the fourth best overall throw in the state. Jordan Booker won the 400 meters while also running the anchor leg in the Knights’ two relay victories, while Joel Latson and Jaylen Waddle ran on the winning relay teams. “Our guys simply performed incredible. In a championship meet, you want to perform at your best, and that’s what they did,” said Episcopal head track and field coach Marc Klinkerman. Meanwhile, the Episcopal girls finished second at the SPC meet. Georgia Wahl set school records in winning both the high jump and triple jump, while also finishing second in the 300-meter hurdles and third in the long jump. Twin sisters Devina Schneider and Jahnavi Schneider were outstanding, with Devina winning the 800 and 1600 meters, and Jahnavi grabbing gold in the 3200 meters. She also finished second to her sister Devina in the mile run.